48 hours, 24 minutes and 15 seconds, 2018. Terracotta, glaze, dimensions are to be determined. This work is currently in development and partnered with the White Wreath Association: Action Against Suicide. Further information follows and will be updated via this page and the 'news' page of this website. According to the most recent global estimate by the World Health Organisation, a person dies by suicide once every 40 seconds. 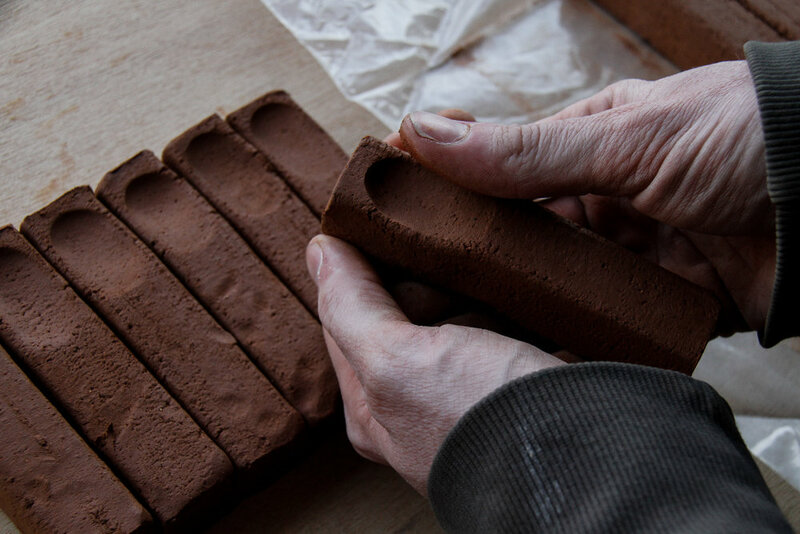 In performative response and using terracotta, the artist created a handmade piece every 40 seconds, with no breaks, as a 1:1 representation of each death by suicide within the finite period of the performance. The performance period commenced at Alexandra Lawson Gallery on the morning of Monday, September 10th, 2018 (World Suicide Prevention Day) and lasted for 48 Hours, 24 Minutes and 15 Seconds, resulting in 4,356 ceramic pieces. The performance ceased due to the artist reaching a personal limit of mental and physical capacity. The action performed within every 40 second period involved refining the edges and base of an extruded clay form, then leaving a gestural thumb impression at the peak of each piece. This results in individualised loosely-figurative objects. For the primary purpose of suicide awareness and prevention, 48 Hours, 24 Minutes and 15 Seconds results from a fleeting performance in response to an ongoing crisis. Having the creation of the work cease due to mental and physical inability suggests that despite its production coming to an end, if capable, the creation of the objects would indefinitely continue. The production of the work was streamed live via Youtube. The pieces created during the performance will be first exhibited in June of 2019 as one of seven artist/social enterprise collaborations for A Fierce Hope, the keynote exhibition for Brisbane’s newest art and cultural hub Adderton: house & heart of mercy. Process images showing the 'performative element' of the project. Photography: Alexandra Lawson.